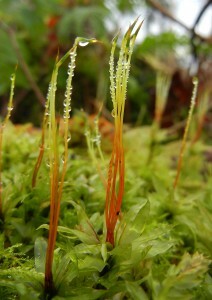 Mosses (Phylum Bryophyta) may be found all around the world and inhabit diverse habitats. Habitats range from exposed rock types, shaded coniferous forests, to bogs. 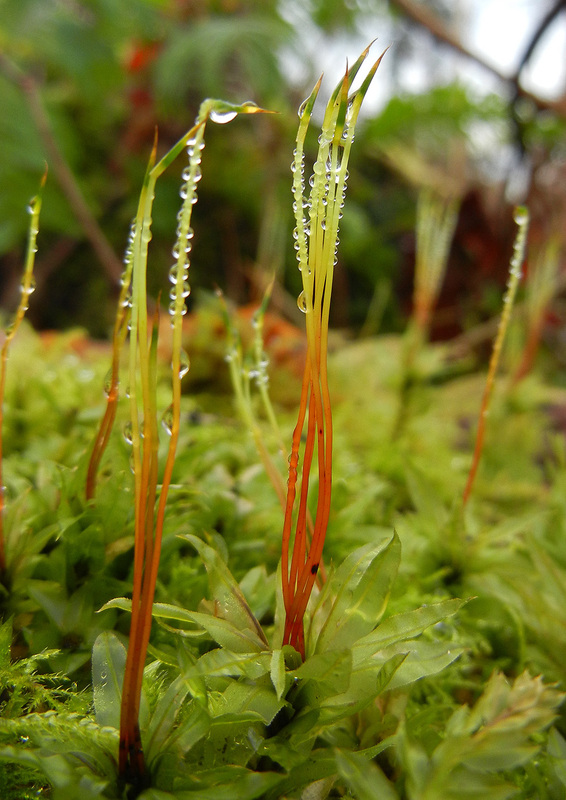 Mosses can be distinguished from liverworts (Phylum Marchantiophyta) and hornworts (Phylum Anthocerotophyta) by a number of gametophytic and sporophytic features. The gametophytic generation of mosses is characterized by its organization and morphology of its tissue. Much like tracheophytes (commonly known as vascular plants), mosses have leaves. Leaves are unistratose and radially arranged around a stem. Mosses are may be acrocarpous, with their shoots grow vertical in tufts with the sporophyte terminal on the shoot. 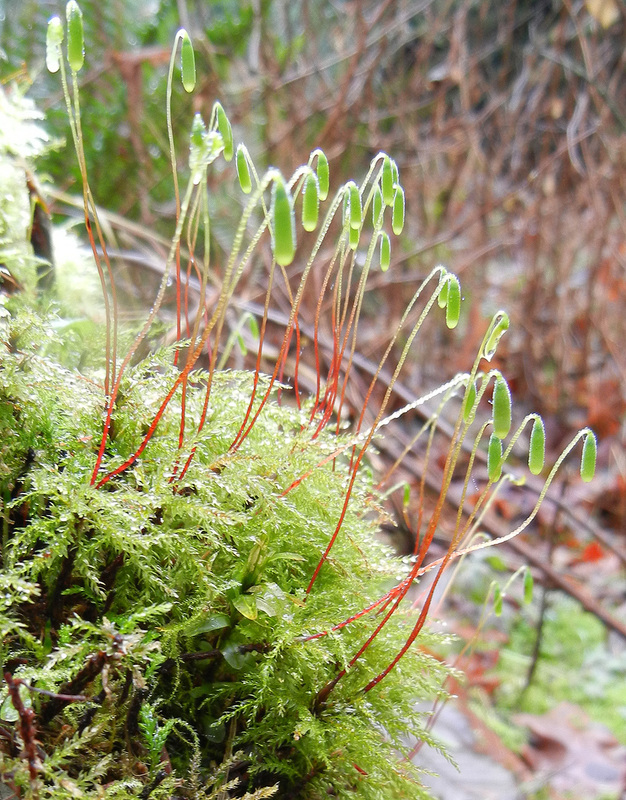 Mosses may also be pleurocarpous, with their shoots grow laterally in mats with the sporophyte on specialized buds or branches. Species can be distinguished by means of the features of their leaves. A commonality to leaves is the presence of chloroplasts, and lack of oil bodies. The conducting tissues of Bryophyta are not lignified, thus are not tracheophytes. 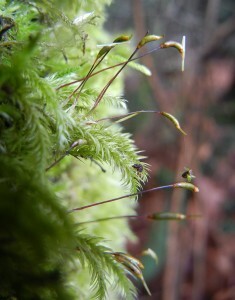 Nevertheless, mosses contain conducting tissues known as hydroids, for water transport. Mosses rarely contain leptiods, these cells are responsible for nutrient conduction. Hydroids and leptoids may be found in the stem or leaves, depending on the species. The sporophytic generation is more complex than liverworts and hornworts and generally defines the phylum. Growth of the sporophyte is determinate and there are three main parts of the sporophyte known as the foot, seta, and sporangium. The seta supports and elevates the sporangium to aid in spore dispersal. The seta elongates to elevate the sporangium before the sporangium and spores are fully mature. The calyptra, a protective tissue around the sporangium arising from the ventor of the archegonium, expands after seta elongation and falls off the sporangium when the sporangium is mature. 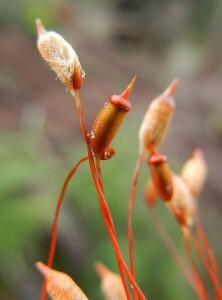 The spores are released when the sporangium is mature and typically dry. An operculum, at the apex of the sporangium, falls off to expose peristome teeth that aid in the dispersal of spores. Peristome teeth arrangement and morphology aid in distinguishing certain taxonomic categories. Finally, stomata are typically present on the walls of the sporangium. Stomata aid in gas exchange and are also found on tracheophytes.